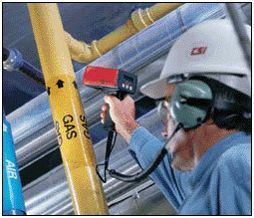 There are great energy savings to be made by using ultrasonic detection to locate leaks in compressed air, nitrogen and other pipe lines. There is great potential for energy savings by locating and repairing leaks of compressed air, nitrogen and other gases. Leaks create noise above the human hearing range. But ultrasonic detectors make them audible so that they can be tracked down. We can detect, tag and issue you with a report of all your leaks.